Formerly fearsome foe turned friend… Learn how to best use this powerful battle angel randomly dropped from the Ashes of the Armada pack below! The battle angel is a primarily offensive companion. She has two hits that can each do more than a hidden assassin (both Haywire hits). The third power is a fantastic utility power. Her available epics are somewhat lackluster, but with an agility or critical buff, she can chain damage together quite nicely. Her somewhat low health and very dangerous powers make her a prime target for your opponent, but she is almost ensured to take a unit down with her. Haywire Shot: This is the Battle Angel’s most potent damage dealing power. It has two different “rolls” it will randomly select from, a 2x weapon power and a 3x weapon power roll. If you’re a buckler and use her Haywire Shot coming out of Fog, a “low” roll will do just over 2000 damage. The high roll easily does over 3000 damage and a critical can do nearly 6000 damage! Anything but the lower roll will one-shot an unprotected unit. Getting this attack off whenever possible should be a high priority. Surge of Technomancy: Surge is essentially a long-range, single target, mini-Purge Magic. It removes the lowest buff on the target. It also does 400-600 damage before criticals are factored in and can target hidden units. This is a fantastic utility power that will make any opponent’s life miserable! Flanking- Not a particularly great epic if you’re a swashbuckler, but if you can avoid it if she’s hidden and take advantage of it when she’s not, it can be quite beneficial. 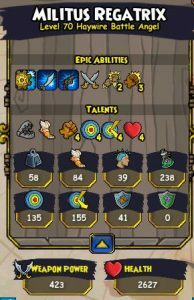 These epics may seem boring, but they keep an otherwise overpowered companion balanced. Who can best use the Battle Angel? The battle angel suffers from a low movement range (a measly 4 tiles). Her Haywire Shot has an even lower usage range, merely 3 tiles. What does all of this mean for her usage? Well, it means that the battle angel is an all-star on a team that can allow her to approach without being targeted (Swashbuckler with fog) or when used on a character that can invest resources into protecting her (Privateer with accuracy/dodge buffs, forts, heals, etc.). 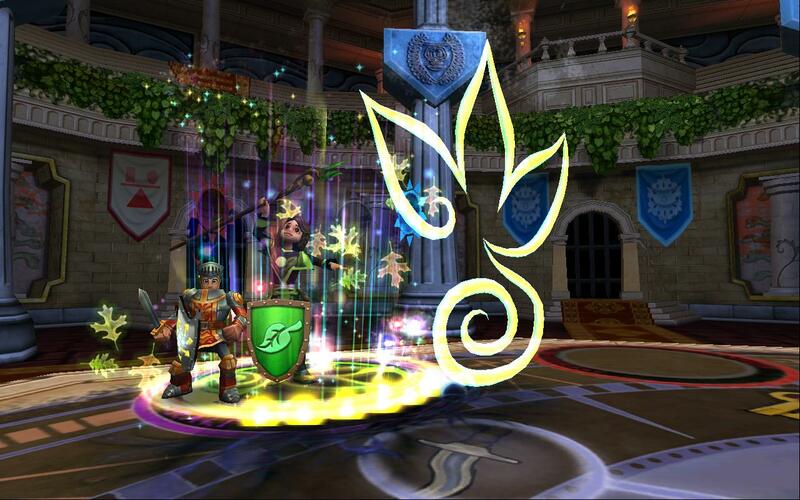 A buckler can fog, approach, and use a haywire shot or strike to instantly kill or cripple a high threat unit. Privateer can’t give her hidden, but they can use forts and revives to extend her longevity and ensure that she remains a thorn in an opponent’s side for a long while. Other classes can use her, especially since she has first strike 3, but there are better options. If she can get off all 3 of her attacks, you’re generally on your way to winning the match. I struggle to think of a time when I used all 3 of her attacks, got good value from them, and then went on to be defeated. If you’re a privateer, don’t be afraid to use a fort or revive on her in order to guarantee her survival. Swashbucklers should not waste their much more limited heal and fort supply on her. The angel should be used to spike down a high threat unit, ideally when coming out of fog. Units with quick draw and true grit can and will respond to the angel’s haywire shot, possibly resulting in a chain. Haywire strike has a chance to stun her or the targeted unit. This effect is random, so there’s no controlling it. If an opponent or their companion’s bottom-most buff is a fort or an absorb, prioritize using Surge of Technomancy to remove it. However, if she’s hidden, don’t waste the hide damage. If she’s hidden, only use it to remove protection when the targeted unit has an absorb on since your hide won’t break. Surge of Technomancy is a magic attack, and will thus be Witch Hunter’ed if she is in Witch Hunter range. Assume that, if she is hitting while in hidden with a haywire shot, your attack will not kill (unless the opposing unit is below 1.8k health). Leaving an opposing Pete or Temujin alive with 600-700 health is very dangerous, especially since you are unlikely to kill him before he has a chance to attack in Turn the Tide. Haywire shot knocks the affected target back 1-3 tiles whenever possible. This can be taken advantage of in order to knock your opponent into traps. It can also be detrimental, if the unit you knocked back has htl (if the knocked back unit doesn’t move, its hold the line radius will be in the same place it was before it was knocked back). Poor troggy never saw it coming! 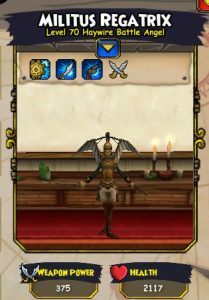 Have you used the Battle Angel in PvP? How did it go? Let us know in the comments!